We are almost back to normal for this Friday's line up. No football game, so Shake Rattle and Roll should be on at its regular time. Tony will have the Classic Rock Show on at 8 but I will not be in for the Friday Night Concert. Look for Tony to step up and play P...... (don't think I would give it away - did you?). You will have to tune in at 10 to find out. Thanks to all those who submitted questions for the Mayoral Debate. If we did not use your question, we will try to get the Mayor Elect back to answer them. Stay tuned for election night coverage on WAPJ. WAPJ is again broadcasting selected Torrington High School football games. A schedule will be posted shortly. Torrington Ford Lincoln Mercury has been a long time supported of WAPJ. A business decision has forced them to suspend their sponsorship for now. We thank them for their support and hope they can join us again in the future. A continued thanks to all the other current sponsors and friends of WAPJ. Ooops - Where is the rebraodcast? As hard as we try to rebroadcast popular shows during the week, sometimes we run into technical problems. Today (Friday) we had a problem with the recording of "Its a Blues Thing". We apologize for the error and we are trying hard to improve our performance. As volunteers, every time something goes wrong, we look at it as a learning experience. That is why we can take someone with no radio experience and get them up to speed in such a short time. We are not afraid to acknowledge our mistakes and pass the knowledge on to the next person. Thanks for your patience as we make WAPJ better every day. Some of the blogs on Blogger have been compromised by hackers. They have inserted programs to download viruses to computers who are viewing the blog. Google says this is not the fault of Blooger but the user's computers that do not have up to date anti-virus and have been infected. 2. Keep your antivirus up to date. WAPJToday does not allow comments and I have kept it as simple as possible - no java, etc. Want to be on Radio? 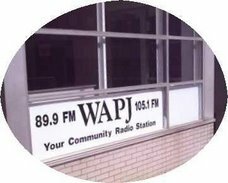 Do you want to be on the air on WAPJ? It is easier than you think. First you need to have a theme or idea for a show. Call the station and leave a message for Tony Henry, Station Manager. He will arrange a meeting with you and go over your ideas. Then usually you are assigned a mentor (or mentors) where you work with them to understand the equipment and policy and procedures. When Tony feels you are up to speed you will be given your own time slot. If you can program a VCR you will be able to handle our equipment. The sooner you start, the sooner you can be on the air - part of Torrington' s Community Radio. The Classic Rock Concert for Friday August 24th was Atomic Rooster. Scheduled for August 31st is ???????? WAPJ had a booth at Coe Park in Torrington on Saturday August 25, participating in Heritage Day. Thanks to all the volunteers who helped out, Tony, Chris, Miles, Mike, Barry, Minnie, Steve, Josh, Bob, Bob, and people back at the studio, Gary, Alan and Colin. Did I miss anyone? The new T-shirts looked great - Thanks Mrs. Temkin! If you missed Heritage Day, make sure to put it on your calendar when it comes around next year. For all those who have been checking out this site, thanks for your patience. We are making some changes to the web site and hope to have everything up and working again soon. In the meantime, don't hesitate to call 860-489-9033 and let us know what you think. We don't bite - we would be very happy to hear from you. WAPJ will be covering the Coe Park 100th Anniversary on June 10th from 1 - 5 pm. If you are around, please stop by our table and say hello. After several months of deciding how and whether I could keep the Doctalk show alive as well as do my weekly music show on Tuesdays, I have come to the realistic conclusion that for now I'm going to have to stop the Doctalk show until further notice. I'm too busy to make it worthwhile! Reel music will continue to roll on as before. 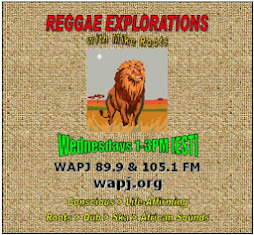 WAPJ Today is an up to date source of what is going on with WAPJ, it's schedule and on air staff. Don't hesitate to call in at 860-489-9033 with requests, comments and suggestions.